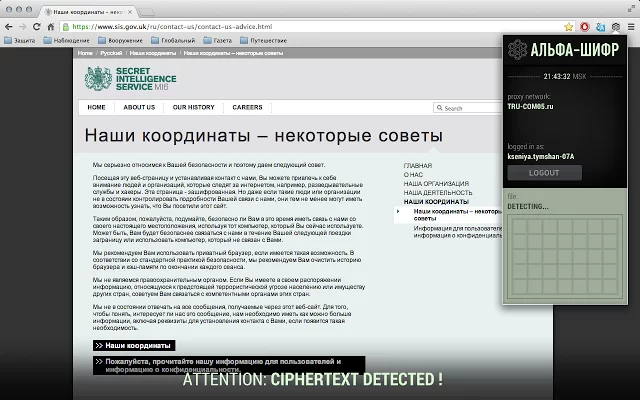 Alfa-Cipher is software distributed on http://alfa-tsentr.ru as a Chrome browser extension that appears to provide access to a 'darknet' of phantom pages and websites. It first became available on 19 September 2013. It appears to have been developed as a joint project between TRU and Third Roman Intelligence Directorate. Here is a direct link to Alfa-Cipher on the Chrome web store. ALFA-CIPHER is an enterprise software application developed for intelligence operators jointly by TRU and OAO Alfa-Tsentr in the Russian Federation. ALFA-CIPHER is one module within the proprietary Aggregate Analysis & Event Prediction System (AAEPS)—commercial name, ALFA-APPs. ALFA-CIPHER IS RESTRICTED FOR USE BY AUTHORIZED GOVERNMENT AND PRIVATE SECTOR OPERATORS ONLY. The online transmission or sharing of TRU-COM network account authentication information between multiple persons is strictly prohibited. Such action will result in permanent suspension of access privileges and potential criminal prosecution where applicable. • embed cipher text files on any third party server or website. Greater ALFA-APPs platform, including ALFA-ARKIV is developed for use by various government and corporate clients. Goal is to provide operators with effective means of gathering, communicating, and analyzing data on a chosen subject in real time utilizing wide breadth of information sources. This section is under active development/research.